Highly Commended Best New Product in the 2018 Healthy Food Guide Awards. Not many people in New Zealand are familiar with kvas. Here at The Kvas Company we have set out to change that. Kvas originated in the Slavic countries of Eastern Europe, where according to legend it has been brewed for 5,000 years. True or not, the first mention of kvas in the Old Russian Chronicle dates to 989. While similar drinks once popular in other countries faded away in the industrial revolution, their traditions lost in the wave of urbanisation, kvas has retained its crown in Russia and other Eastern European countries. The word kvas means ‘ferment’, and there are many other related words relating to fermentation – a zakvaska is a starter culture, kvashennaya cabbage is sauerkraut. There are a variety of different kinds of kvas – oat kvas, beetroot kvas, apple kvas, but when a Russian just says ‘kvas’, they mean kvas made using rye bread. Kvas can be made with yeast, by lactic fermentation, or by a combination of the two. We make our kvas by lactic fermentation only – we love the lighter, more refreshing taste, and the added benefit of all those healthy lactobacillus cultures. Despite the name, no dairy is involved – lactic here refers to the fermentation cultures, which are also found in sauerkraut, cured meat and other fermented foods. Now, we have brought kvas to New Zealand. 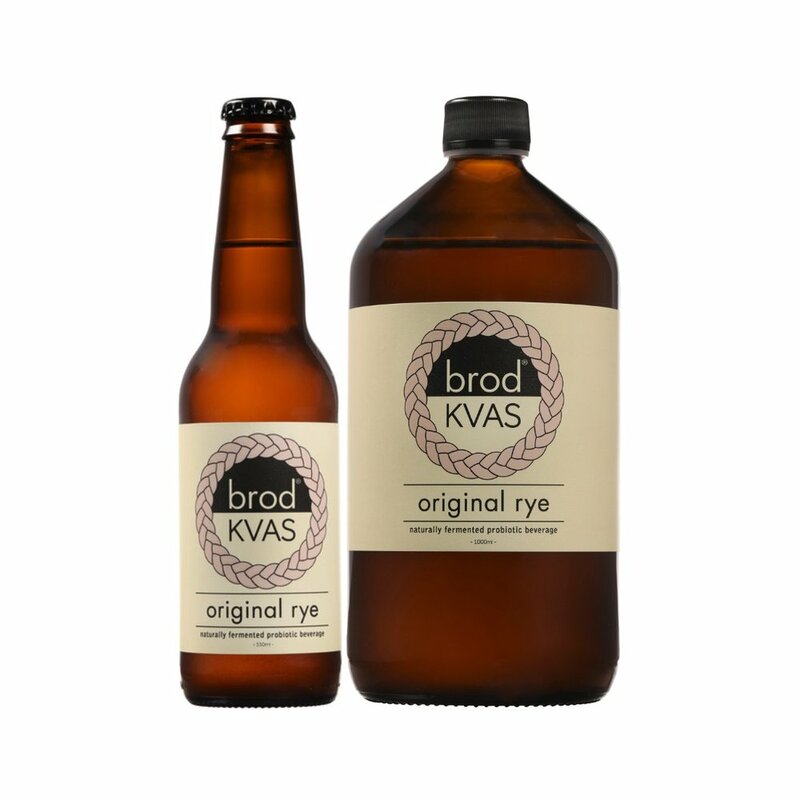 If you’re looking for a low-sugar replacement for soft drinks, if you’d like a refreshing alternative to alcoholic drinks that still feels like a proper drink, or if you’ve been reading about the benefits of probiotic foods and you’d like to try some in your diet, Brod Kvas is for you. If you’re wondering what it tastes like, the only real way to find out is to try some. People drinking Brod® Original Rye for the first time often say it reminds them of their grandmother’s ginger beer, cider, or wheat beer. At the same time, there is something different about it. Russian rye bread is baked with coriander and caraway seeds, which adds subtle complexities to the flavor, and sultanas added to the fermenter give it a certain fruitiness. Thanks to the lactic cultures and low sugar content, it has a refreshing tanginess that makes it equally great on its own or with food.